Flash MX Components enable the creation of self-contained design building blocks that can be simply dragged and dropped into any Flash movie. They are flexible enough to be easily customized to take care of many different tasks. You can repurpose the standard elements of your design, application, or game, and use them over and over again. Components can be used by anyone, not just the person who created them. 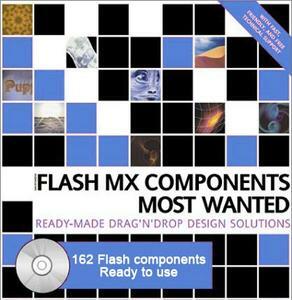 So in this book, we've done all the hard work for you and collected together the Most Wanted components that will make your life easier. Flash components included are: Event Calendar; Text Editor; XML News Ticker; Tool Tip; Sketchpad; Video Player; Image Scroller; Patter Generators; Tab Contrl; Sliding Panel; Color Picker; Game Player Selector; Particle Emitter; Layout Manager; Data Grid; Movie Loader; Image Modulators; XML to ActionScript Converter; Virtual 3D Trackball; Text Animations, Dynamic Text Manager, and plenty of other Flash.